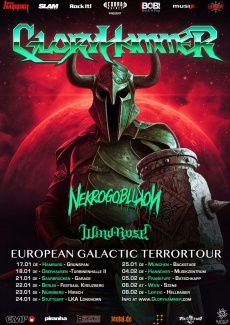 Raise your fist and ready your battle axe: Gloryhammer will embark on an epic quest throughout Europe in January and February 2020! This literally fantastic power metal act will come bearing their new album, “Legends from beyond the Galactic Terrorvortex”, which is due out in late spring 2019 via Napalm Records. The galaxy waits in fear for the return of Angus McFife XIII, who fought the greatest battle the universe has ever heard of, against the evil sorcerer Zargothrax. All hope of the Kingdom of Fife lies in the strong arms and the infinite wisdom of their young prince. Register now your email address and never miss events, dates and news for GLORYHAMMER.